I’m using Military Weapon Silver pack for weapons, you don’t need to use it to complete this tutorial but it’s recommended pack if you are doing game with military weapons. Project is based on Third Person Template which can be found when creating new project. I have found similar system in marketplace but I don’t know if it’s event based. 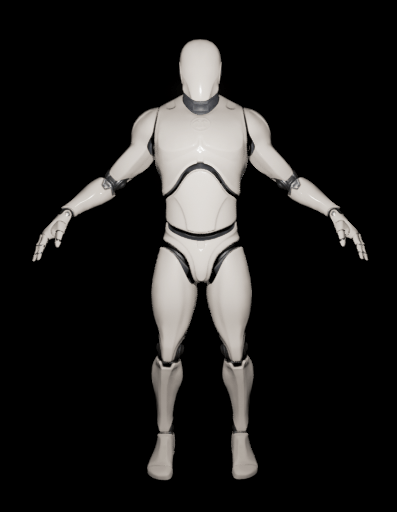 Right, left, back and back second will be used as attach point for weapons. Rest are weapon locations when equipped. Create new Blueprint extending from Actor named BP_BaseWeapon. 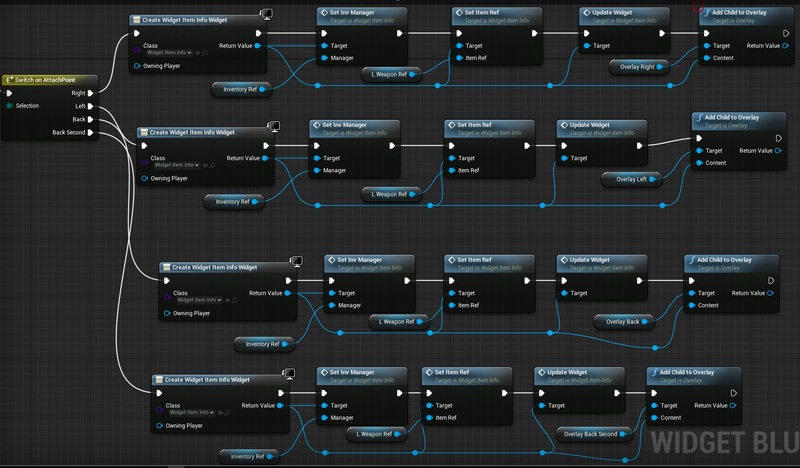 Then create new blueprint extending from Actor Component named InventoryManager. Leave them for now and let’s add base data. It will be used to determine which type of ammo weapon is using. This will be used to determined which part of body weapon can be attached. This will be used to store data about how many ammo for which type we have. Create new function library named MyLibrary. Library functions can be called from all classes so they are super useful. One thing to note – they don’t have world context which means nodes like Get Player Controller, Get Game State, Get Player Pawn won’t work as they need world context. You need to pass world context to functions if you really need them. Libraries are great for storing math functions that you will use in different classes. For our example we will create functions that will return socket name depending on AttachPoint enum. Open MyLibrary and add two functions. 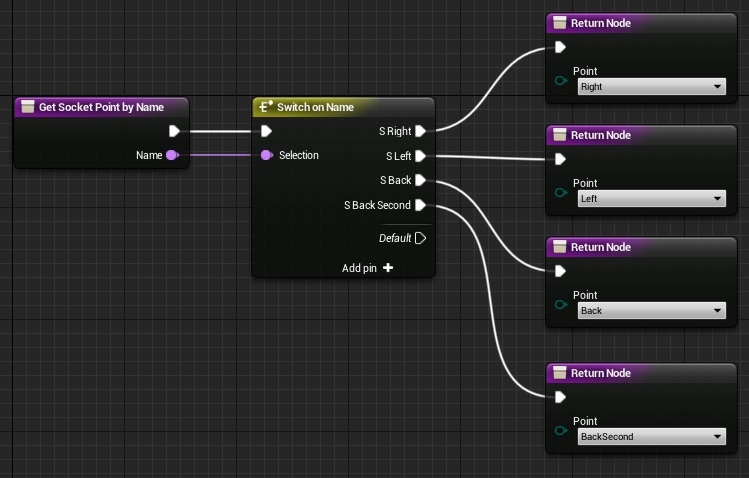 Names in Switch should be equal to socket names added in character mesh. AmmoCurrent int Holds how many ammo do we have in magazine. AmmoMaxInMag int Holds maximum capacity of magazine. WeaponName Text What’s the name of the weapon used in UI. AttachPoints AttachPoint enum array Array of points that this gun can be attached to character. AmmoType AmmoType enum Which ammo type this weapon use. isEquipped bool Is weapon currently equipped. EquipSocketName Name Name of the sockets that should be used when equipping weapon to hand. isDropping bool Is weapon currently being dropped. For now let’s leave BP_BaseWeapon – we will get back here later. InventoryItems BP_BaseWeapon Reference Array Holds all weapons stored in inventory. SocketStates AttachInfo Array Defines state of all available sockets in inventory. Ammo AmmoInfo Array Defines state of all ammo types that are in inventory. EquippedWeapon BP_BaseWeapon Reference Holds currently equipped weapon reference. In default we are defining the ‘slots’ that this inventory can support. It holds default amount of ammo for each ammo type. OnInventoryStateUpdated. It will be called each time something will change in inventorymanager – this way we will communicate with Character that have InventoryManager. This is basically checking if weapon sockets match SocketStates and if socket state is available. We don’t want to attach weapon to socket that have already weapon attached. This is basically finding matching socket in SocketStates and mark InUse bool as True. 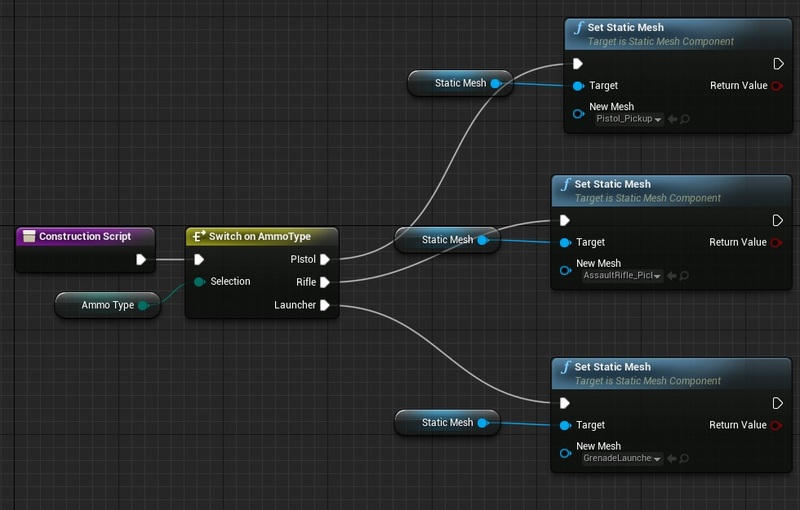 This is basically the best way to work with Array Structures in Blueprints. Store index, store make new structure info and then set array element. It’s proven to work on Standalone / Mobile and cooked builds without a problem. It sounds complicated but it’s super easy. I’m not using WeaponReference here as I want to clear it from SocketStates as we are marking the socket as available for attachment. This is the easiest example how to use structure arrays. We want to add ammo for a weapon type. 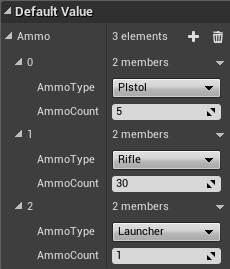 I’m searching for matching type in the array, then store the index and store updated ammo info. Then set array elem. For example we want to add 5 ammo for Pistol. It will search Pistol type in Ammo Array, increase the ammo and then set the array elem. It’s just setting EquippedWeapon variable. USEFUL TIP: I’m always using Functions to change variables if I think I would need to set variable from different class. Setting variables from different classes can cause crashes on cooked build as it creates circular dependencies. Calling functions that set the variable instead directly set it from different class is “good programming practice” and you should use it in Blueprints as well. It’s easy. Search for socket that Weapon can support and check if it’s available. If yes – update the socket, store the weapon reference and call Attach on Weapon. Again it’s easy. Find matching Weapon in Socket States and clear it out so it can be used again. We have added all necessary functions now it’s time to add three events. And that’s all in InventoryManager! Now we need to move back to BP_BaseWeapon. 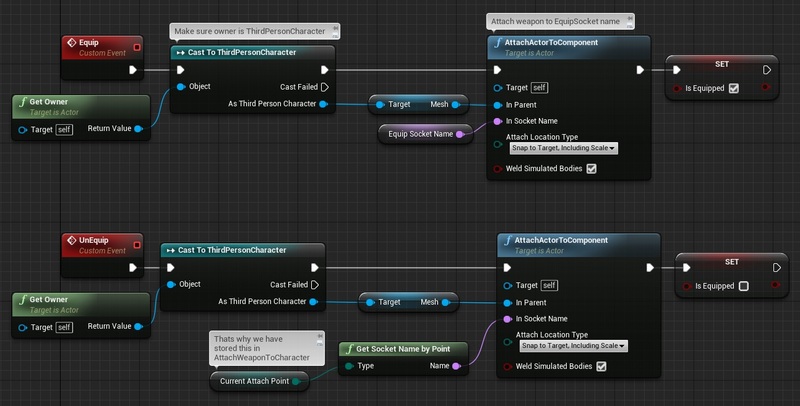 Make sure you have added InventoryManager component to ThirdPersonCharacter blueprint! This is basically the start of adding items to inventory. Now last event – Drop which should be treated as placeholder. And this is all in BP_BaseWeapon! 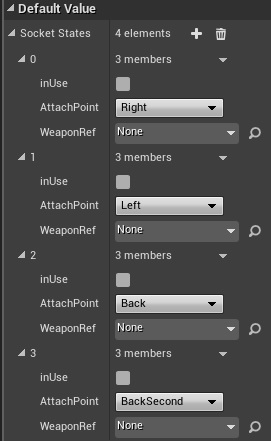 Now create Weapon_Rifle, Weapon_Launcher and Weapon_Pistol blueprints extending from BP_BaseWeapon and fill the variables. Now place those weapons to your level so you can pick it up! AmmoType AmmoType. Editable. Which ammo type it should add ammo to. AmmoToAdd Int. Editable. How much ammo it should add. You can use different meshes. And that’s all, now you can pickup ammo! isActive bool. Should be set to True in defaults. Holds if this widget is currently visible. 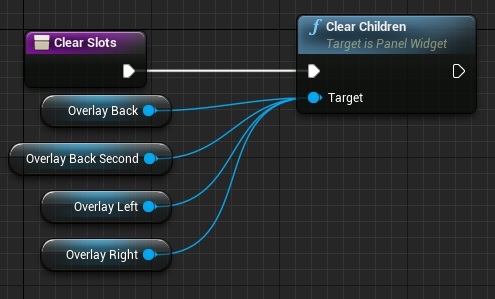 Currently (UE4.10) there is no other way to get input in Widgets. You need to use Player Controller. And that’s all in this widget! Add new Distpacher named OnClicked. It just hides Equipped text if weapon is equipped and sets the name of the weapon to the UI. As you can see I’m passing Weapon and Manager references. Now we have our Widgets we can move with Inventory UMG. Create new widget named UI_Inventory. First create a screenshot of your character on black background. This way we can get alpha in UMG. 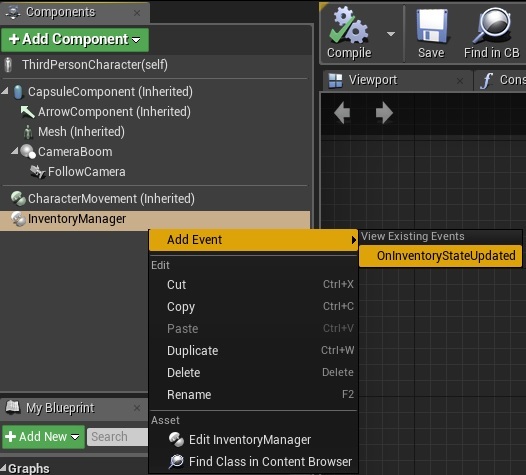 Open Event Graph and add one InventoryRef variable which is InventoryManager reference. This is basically deleting widgets that are added to Overlays. This is just setting text widgets. It looks complicated but it’s just updating data on created widgets. Simple as that. Now we need to trigger UI_Inventory. Open ThirdPersonCharacter and add UI_Inventory reference variable named UI_Inventory. Thanks to this we are only updating UMG when inventory is updated. wanted to know will you be adding on to this for firing logic?? You can learn fire logic from Shooter Tutorial and add it by yourself. Did you get the fire logic to work? Hi this tutorial is perfect for what I need, got to the end and it works fine but I cant get the Inventory to update, when I drop an item that works, when I pick up the item again, that is not displays in the inventory, I have to close inventory and reopen it for the newly equipped weapon to display, anyone else have that same problem?! Thanks a lot man you really got the cake I’ll donate 10$ as soon as possible. Its a great tutorial and i managed to get to the end and everything is working fine,,but 1 problem is there—when i drop a weapon its showing in inventory but the mesh still lies on the ground and when i walk over the mesh again it is picked up in inventory but the mesh lies there…please help me…. animating in a view port as you add weapons? Can you show me or tell me how you would make that? Do you have a video to how to add animation when the weapon is in his hands. and love this. Hey great tutorial but can I use multiple weapons in same sockets? Example- 10 or 20 rifle classes in same socket?? Can I add more weapons to this system? 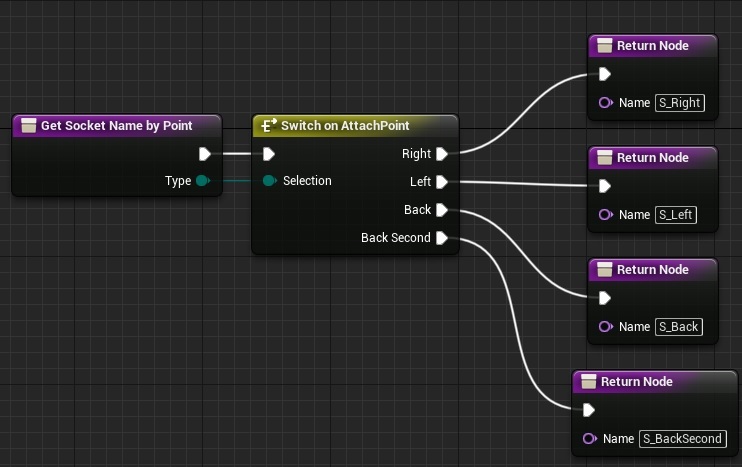 Hi i seem to be having a problem with one of my blueprints, i’ve followed the tutorial but i have narrowed the problem down to my “find a free socket” function and attachment points varible. There is 4 sockets but it is only picking up the object to one of them and thenit doesn’t pick any objects up if the object is a single varible, if its set as an array it doesn’t pick anything up at all. if i leave it as a single varible and then insert make array in the function before the loop it will pick the weapons up but will still go to the first socket and just swaps the mesh i’ve just walked over with the previous one upto 4 and then stops after that. i’ve gone back through the video a few times to make sure i’ve done everything right and i’ve followed it through the same so i don’t know where i’ve gone wrong can you give any advice? how did you became game producer? how вid you made first money for it?